Specializing in treating golfers allows me to treat a lot of elbows. “Golfers elbow” is one of the most common injuries in golf (I know, shocking). What I find most interesting though is that pain in your elbow with golf isn’t always a true “golfers elbow.” Sometimes that persistent pain in your elbow could actually be a nerve problem coming from your neck. Please allow me to drop some knowledge. Golfers elbow (or medial epicondylitis as the medical folk like to call it) is an inflammation of the medial epicondyle. It is the bony prominence on the inside part of your elbow. Golfers elbow usually happens because a golfer flips the club through the hitting zone. This over activity of the wrist flexor and pronator muscles pulls on the tendon attachment and causes pain and inflammation. The pain is usually localized to the elbow area and can be reproduced when you poke at it, or resist the wrist flexor and pronator muscle groups. I have found on numerous occasions though that pain on the inside of the elbow for golfers is frequently NOT golfers elbow. Most golfers that I treat are not professional golfers (even though most think they are). By that I mean that most are working at a desk job during the week and maybe get out and play once to twice a week. That amount of volume is not usually enough to create a true golfers elbow. 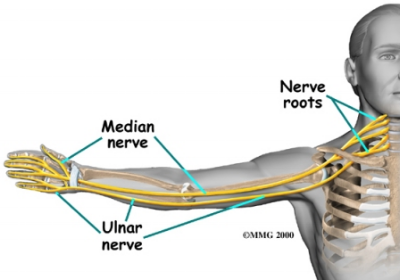 Take a look at this road map for the median and ulnar nerves in the arm. The nerves run right around the medial epicondyle. That is why a nerve traction injury, or cervical spine radiculopathy, can feel like a golfers elbow but it’s actually a neurological injury. The nerve usually gets irritated up at the nerve root in the cervical spine. Although that is where the injury occurs, the pain usually presents down in the elbow and forearm. Now let’s talk about how that nerve root gets irritated. Like I said before, my usual patient is the golfer that works all week and then golfs on the weekend. 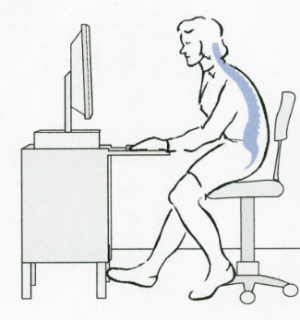 Most people have a sedentary job and really crappy posture. Does this picture look familiar? The common rounded forward position leads to a hyperextension at the cervical spine. That hyperextension leads to compression of the cervical spine and compression of the nerve roots. This postural problem arises when you take that posture and try to swing a golf club. A normal golf swing requires a lot of rotation out of the cervical spine. Everyone always focuses on their shoulder turn and the poor neck gets passed over and neglected. When you keep your eyes focused on the golf ball and turn your shoulders your cervical spine is still moving. That extra rotation puts even more compressive force on the cervical spine and those nerve roots. That is where the problem arises from and leads to the pain down the arm and into the elbow. Here are some simple tests and fixes to see if your elbow pain is coming from your neck. Take your normal set up posture like you are hitting a 5 iron. Now, try and turn your head like you are trying to look at your shoulder. If you can’t easily turn your head without feeling a restriction in your neck you have a cervical spine problem that is probably due to poor posture. If you want to test if your nerves are involved, try this. Hold your arm up like you are holding a waiters tray. Now keep your wrist extended and stretch your arm out as you turn your head away from your hand. If this reproduces any elbow pain, guess what, you have a nerve problem not an elbow problem. If this is you then try this exercise to get your nerves moving better. This will hopefully calm the nerve pain down and minimize the pain you are feeling with your golf swing. OrthoCore if here to help! For more information or to make an appointment at either our North Kingstown or Westerly location, call us 401-667-0131 or Contact Us.